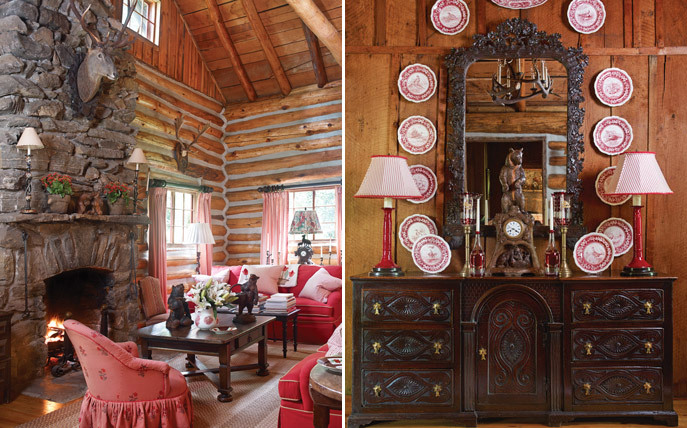 When our newest edition of Southern Home was placed on my desk, my heart skipped a beat when I came to the article “Mountain Hideaway.” In the fall I always dream of living in the mountains where the autumn leaves surround you with an explosion of color. 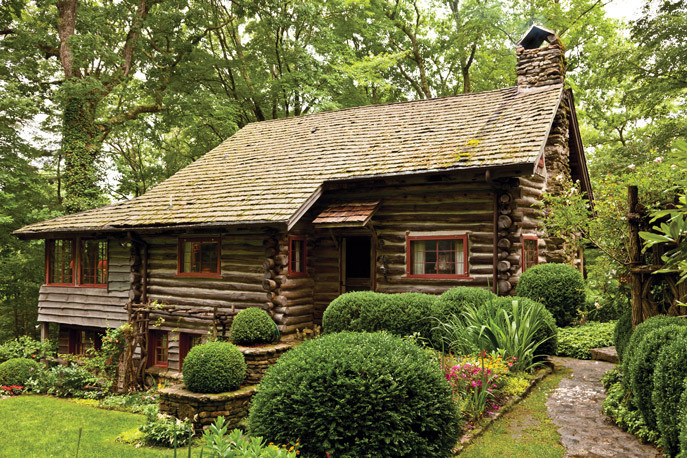 The charming exterior of this classic log cabin. Photography by Emily Jenkins Followill. Toby West and Tom Hayes own the most enchanting cabin, and I wanted to share a few of the wonderful details that make this place my dream home in the mountains. As we all know, I am a red person. The exquisite red upholstery and decorative accents are just perfect for the setting. 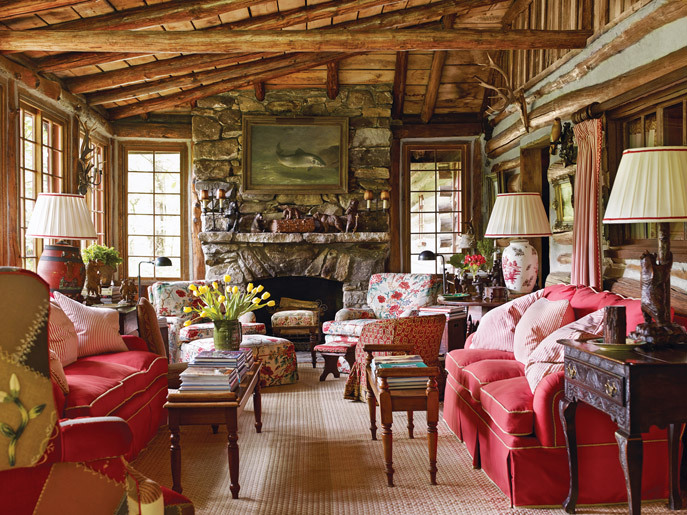 I love the contrast of the exposed logs and beams with sophisticated furniture and accessories. Each chair gathered around the table is different, which adds character and an element of fun to the dining area; their lovely collection of red-and-white transferware completes the look. 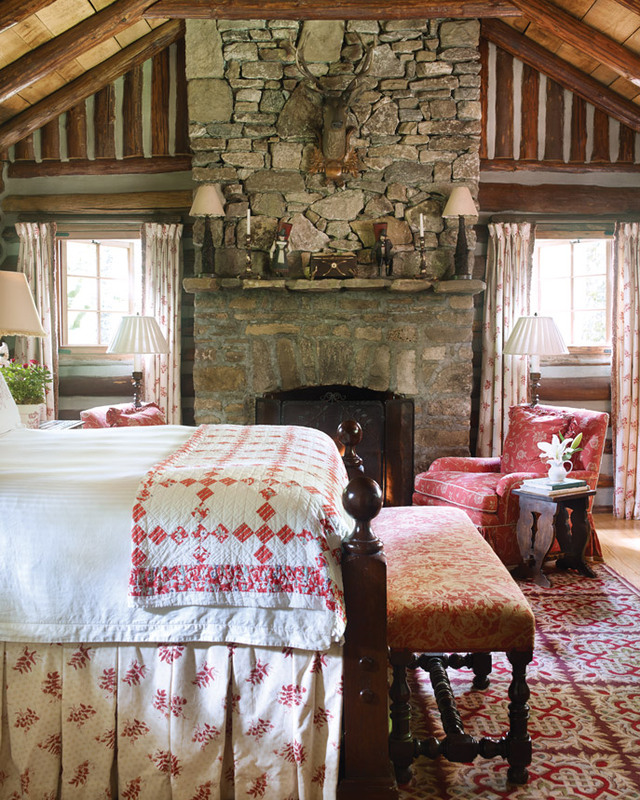 While I loved everything about the home, I found myself especially thrilled when I came to the bedroom appointed with a red-and-white quilt elegantly arranged at the end of an antique oak bed. I would never tire of this peaceful room. The entire magazine is filled with beautiful homes where every detail is perfectly planned and presented. There is something for everyone and every taste. What is your dream home like? I would love to hear about it. I have this fabulous magazine and love it…so excited that you created it! 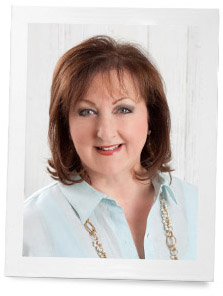 !…Love everything about Southern living and life! Phyllis, I want to move into that darling cabin today and spend the season. I love every room and would not change a single thing. Its just a feel good cabin with warmth, decorating style, and love. Their cabin is lovely. 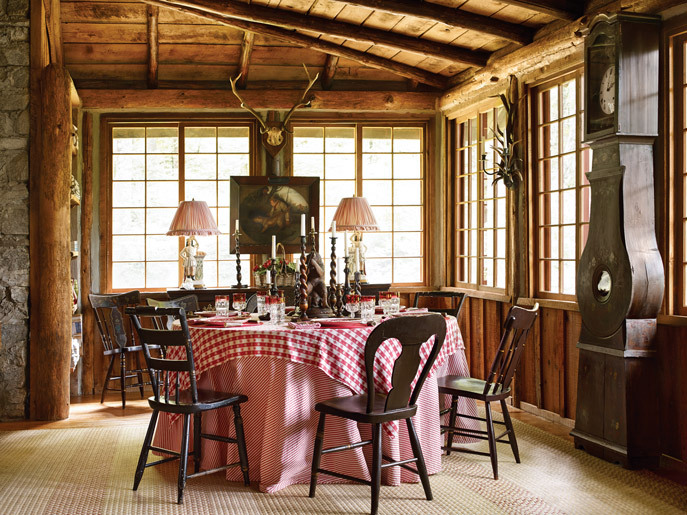 It reminds me of the beloved Charles Faudree’s style that he used in decorating mountain homes. having you cake and eating it too. Beautiful. Love this rustic yet elegant cabin. Who wouldn’t love spending some relaxing time there! i want to live there!!!!! Thank you Phyllis for sharing such a Beautiful cabin. I am a red person also! I am in the mountains in Jackson Hole WY. Right now . Enjoying every minute. Being from Texas, every chance we get we head to the mountains to enjoy the cool weather and the beauty that God has created. Our Favorite place is Estes Park, CO. Hoffma Publishing is the Best. Love their magazines. Thank you….have a fun trip. My dream home is exactly where I live now, McKinney, Texas. I am a very fortunate gal! Love all the publications. Can’t wait to see the Chtistmas editions! It has been Christmas here at Hoffman Media for weeks.!!! Oh my it is glorious. Absolutely gorgeous! My fantasy is I have more than one dream home–one by the ocean, one in Deep South, one in Scotland, somewhere around the Mediterranean…and one in the mountains…which would certainly be this one! Move over Phyllis, I want to live there also! Building our dream home now in the mountains of Western North Carolina. Will have to get a copy of the magazine! I can’t find Southern Home magazine nor a place to get a subscription. It looks beautiful and I would love to get it. O wow , wish I could jump right into that cabin and stay !! I love red too. Looking forward to picking up this issue. Thank you Phillis !! I am a red girl…..and this tasteful use of red just makes me smile. The splendid interior so much reminds me of some of the enchanting interiors I’ve seen in Alsace France, I love it! Wish I could enjoy this beautiful issue curled up by one of those charming fireplaces. Thank you for such a pleasurable article. I have the fortune of going to Alsace years ago on a needlework tour. What a beautiful town! Love this Phyllis! Can’t wait to see the magazine. Sherry, you and I have the exact taste! I just picked this magazine up yesterday and I think that cabin was my favorite! Read the entire magazine in one sitting – yet another fine example of Hoffman publications. Thank you for keeping your standards high! Thank you Rita. I loved reading it as well.